Description of Bug (Explain the bug, How is it done, what should it really be doing? etc. An unclear description will not get the bug fixed): There is currently a bug with MVP diamond buff. It's been 3 days since my previous MVP items expired and I am unable to claim any of my MVP cash items, such as 30 days safety charm, wheel of fortune and buff freezer. I have pre-purchased 4 months of MVP so it hasn't expired. 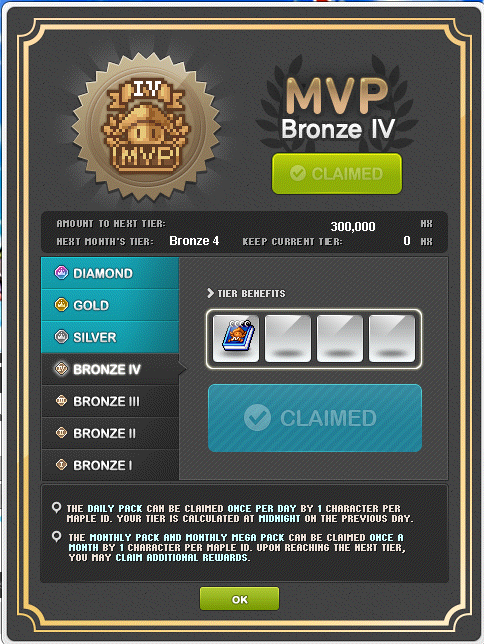 I'm still able to claim my daily MVP diamond and I still receive other benefits of diamond MVP like buff duration and Diamond MVP star force discounts. I'm having the same struggle. Its been about 2-3 weeks since i've had my monthly package. Does it show an error when trying to claim it, or just can't click the option to claim? 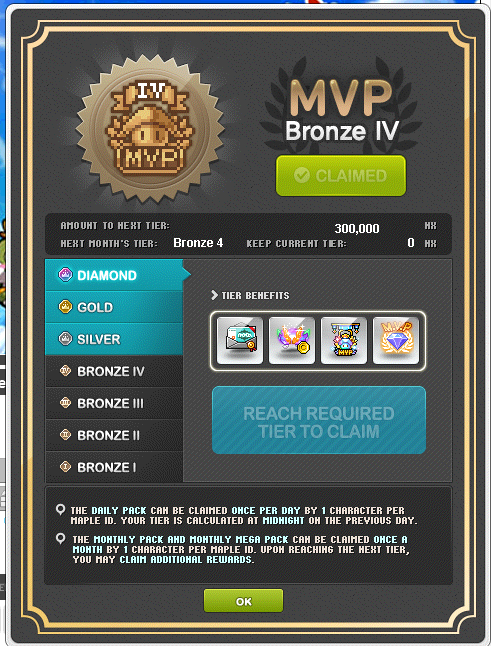 Not sure about the others but for me, the cash shop says that I'm Bronze so the MVP button says there's something to claim, but shows that I already claimed the Bronze monthly and I need to reach the Diamond tier to claim the Diamond monthly. As seen in the screenshot, it's an error, i have 4 item slots free in use, i even checked my equip/setup/cash slots as well they all have enough space.